Electric Island is back in its third annual season of the summer concert and picnic series, with a lineup of international talent. Curators Coda, Platform and Embrace present what may be the best Electric Island to date. Drum Code label boss Adam Beyer, Toronto’s own Art Department, Dennis Ferrer and Green Velvet, Lee Burridge, Hot creations boss Lee Foss, Loco Dice, Tom Trago, Berlin duo Pan-Pot, Recondite, Sasha, Shiba San, Steve Lawler, Tale Of Us, Ten Walls and Tuskegee [Seth Troller & Martinez Brothers]. 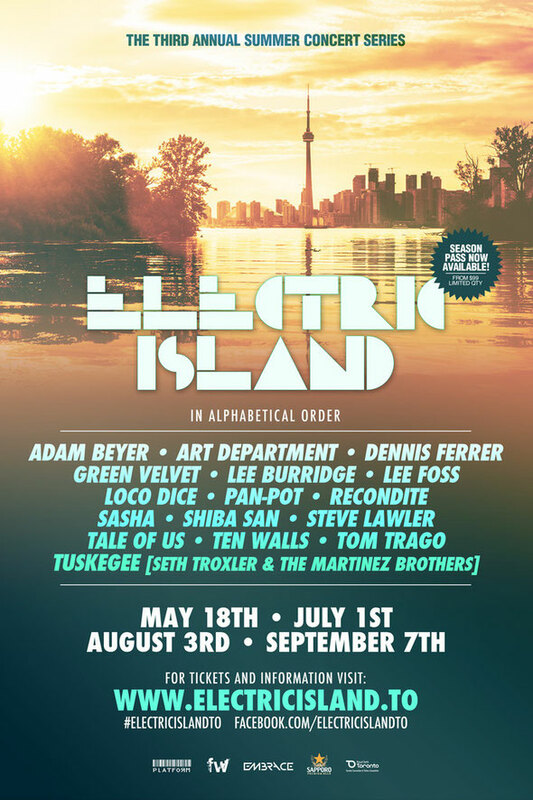 The event is back for another season on Toronto Island, hosting music, art, culinary experiences, and possibly the ultimate picnic vibe.